One Yard Wonders Sew Along – Week 22 Finished Projects and Half-Way-There Celebration! Welcome to Week 22 of the One Yard Wonders Sew Along! We are HALF WAY there and it’s time to celebrate! 50 Free Yards of Fabric! A forward from Kathy: Back in December, Carrie proposed the idea of a sew-along ala Julie and Julia using the One Yard Wonders book. Her idea gave me goosebumps. I knew it was a big undertaking but so cool I couldn’t stop thinking about it. Fortunately I had no idea HOW BIG an undertaking it would turn out to be so we plowed forward–full steam ahead! The amazing Pink Chalk Fabrics Team gets ALL the credit: Carrie, Diana, Jacquie, Tracy, Cindy, Alicia, Melissa, Janis and Jo. They make it happen week in and week out. Carrie organizes the projects, keeps everyone on track and authors the twice-weekly blog posts. Diana takes amazing photos both pre and post project, keeping each one fresh. The rest of the team commits to making a project a month along with a written review of their experience. A HUGE commitment on the part of everyone involved to keep this project on track! We’re giving away 50 Yards of Fabric! And since it’s no fun to make things same-old, same-old we decided to add a little twist. There are some of you that comment ALL THE TIME, week in and week out. You leave really nice comments that we read aloud to the entire office. You keep us going through thick and thin. Just when we think we can’t sew one more project with only one yard of fabric we think of you! You know who you are and we know too. We did a little sleuthing in the blog database and we have a thank you for the top 25 commenters on One Yard Wonders Sew Along posts. The first 25 yards of fabric is for you. Cheers! The other 25 yards is in play. 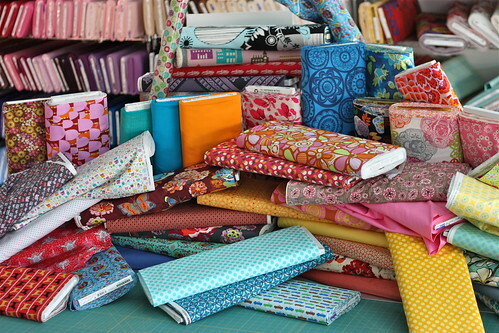 Leave a comment on this post telling us what you’ve enjoyed about the One Yard Wonders Sew Along. Thank you to all of you fabulous Pink Chalk Studio blog followers and to the wonderful team I’m fortunate to work with everyday. You make life fun! This project was fairly straightforward. Cindy was a bit confused finding the pattern pieces on sheet #2. 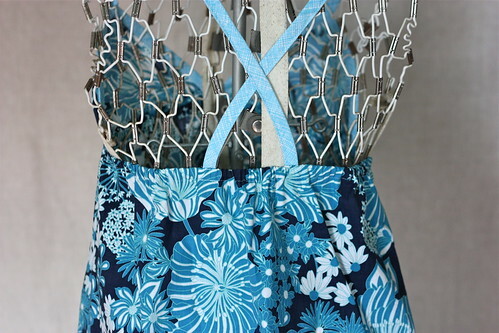 The layout shows a picture of 4 pattern pieces, there were really only pattern pieces for the bodice. The skirt front and back are cut out as a trapezoid. The dimensions are listed (no pattern piece). Cindy chose the bodice piece according to her size. In the end she would have preferred the bodice to be bigger. She crossed the strap pieces over on the back, preferring that look. The bias was created from a contrasting fabric giving beautiful detail to the hem and ties. Perfect for a warm summer night! The Perfect Fit Sleep Shorts really are perfect. The measuring system does work. The shorts were made for Diana’s daughter who likes short, shorts with a rolled waistband. In order to accommodate the waist band Diana cut 1 inch off the top of the shorts then added a 1 1/2 inch strip to the top. This strip then becomes the casing for the elastic. 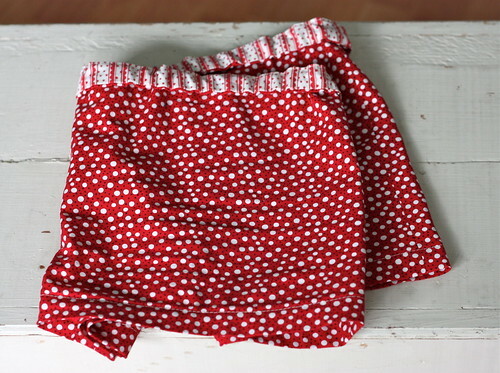 When Diana makes the shorts again, she’ll make a 2″ wide strip and use 3/4 inch elastic which will give a much stronger design element to the waistband. The shorts are a perfect fit. Lexi commented that her bum looks amazing in the new shorts. The highest compliment from any woman!